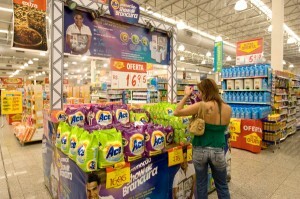 Brazil’s food prices dropped 0.33 per cent in July, clothing prices fell 0.39 per cent and transportation costs contracted 0.66 per cent, Brazil’s benchmark ICPA index revealed on Wednesday. Buoyed by the figures, Brazilian President Dilma Rousseff asserted that inflation is currently “under control”. “IPCA indicates that food prices are contained in the 18 capitals surveyed, which means the basic food basket prices are down. I would say that inflation is now entirely under control, with the lowest showings of this mandate”, said the Brazilian leader. Food prices have come down in Brazil for the first time in two years. Rousseff, however, said that the country “can withstand” the weakness in its currency. The Latin American nation’s annual inflation slowed to 6.27 per cent through July from a 20-month high of 6.70 per cent in June, according to statistics company IBGE. Economists say inflation could rise to 5.87 per cent in 2014 from 5.75 per cent this year, according to the median forecast in a central bank survey released this week.